Prashant Patel Umrao, a Delhi based lawyer, recently made some bold claims over Twitter that has gathered a lot of attention. In his tweet, Umrao, who goes by his Twitter name @ippatel, stated that there are 5 crore Bangladeshi and Rohingya infiltrators living in India illegally. Bharat with 3000 km Length & breadth, having 100 Cr Hindus, doesn't has 100 Mitre land for Birthplace of Bhagwan Shri Ram. But 5 Cr Bangladeshi & Rohingya infiltrators are living here illegally. In less than 2 days, it was retweeted more than 1,600 times and liked more than 3,000 times. This is not the first time Patel has made claims that have been later found to be blatantly false or misleading. Click here, here and here. For over a decade, there seems to be a clear issue with both past and present governments regarding their data on illegal immigrants in India. Union Home ministers have been known to quote figures based on hearsay rather than actual studies or surveys. On July 15, 2004, under the Congress led UPA government, Sriprakash Jaiswal, the then Minister of State for Home Affairs , reportedly stated in response to a question at the Rajya Sabha that 1.2 crore illegal Bangladeshi immigrants were living in India. 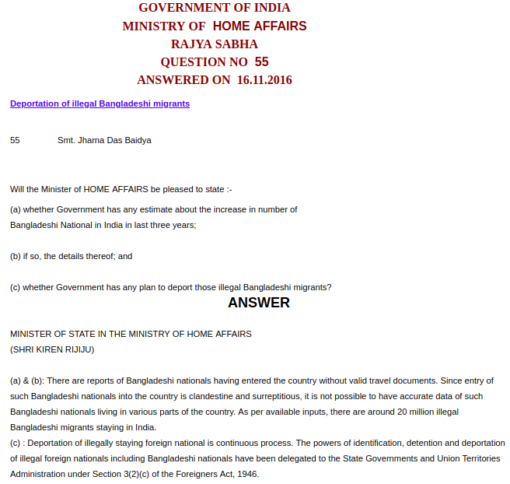 On 16 November 2016, Kiren Rijiju, the current Union Minister of State for Home Affairs, stated in response to a Rajya Sabha question that 2 crore illegal immigrants from Bangladesh were living in India. Comparing it to Jaiswal’s figure, it would suggest a massive 66.7% increase in the number of illegal Bangladeshi immigrants in just a little over a decade. 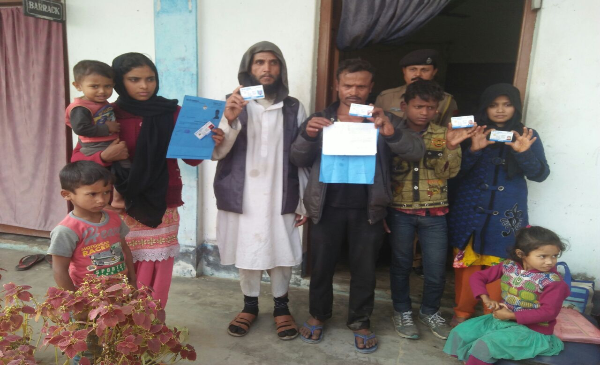 With a new bill amending the Citizenship Act underway, the government was recently asked at the Lok Sabha to state the number of refugees from minority communities (namely Hindu, Sikh, Buddhist, Jain and Christian) hailing from neighbouring countries. Rijiju again stressed that no accurate data is available in the absence of an authentic survey. 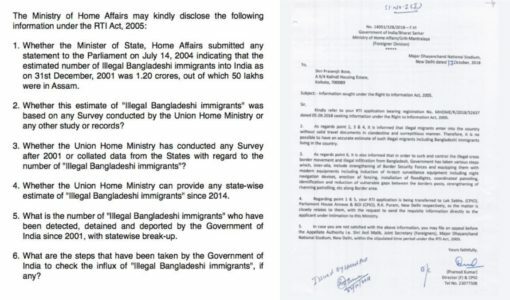 In order to investigate this matter further, a Kolkata based activist filed an RTI application to the Ministry of Home Affairs on 5 September 2018, requesting figures on how many illegal immigrants from Bangladesh were detected or deported. In its response, the Union Home ministry failed to confirm either of the figures of 1.2 crore or 2 crore. You can read the application and the response, as reported on Huffington Post here. Fleeing ethnic cleansing and persecution in Myanmar, the Rohingya population migrated to several South and South-East Asian countries along with some Middle Eastern countries opening their doors to them. Al Jazeera, in one of its reports on October 2017, stated that an estimate of 40,000 Rohingyas may have arrived in India since 1970s. They cited their own data along with that of United Nations High Commissioner for Refugees and International Organisation for Migration as their source. 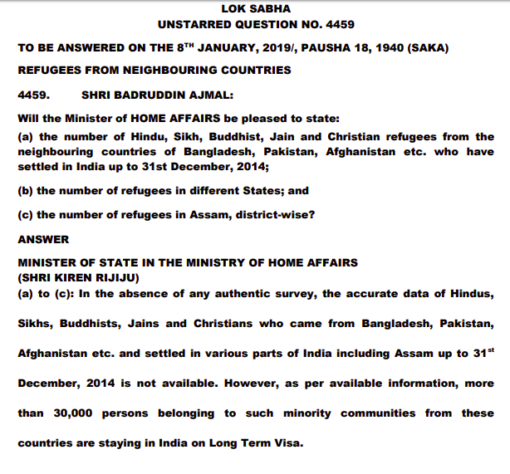 During the latest Lok Sabha session, the government was asked about the number of Rohingyas apprehended by Border Security Forces while entering India illegally, to which Rijiju gave a figure of 478 Rohingyas apprehended from 1 January 2015 to 30 November 2018. So what about the 5 crore figure? 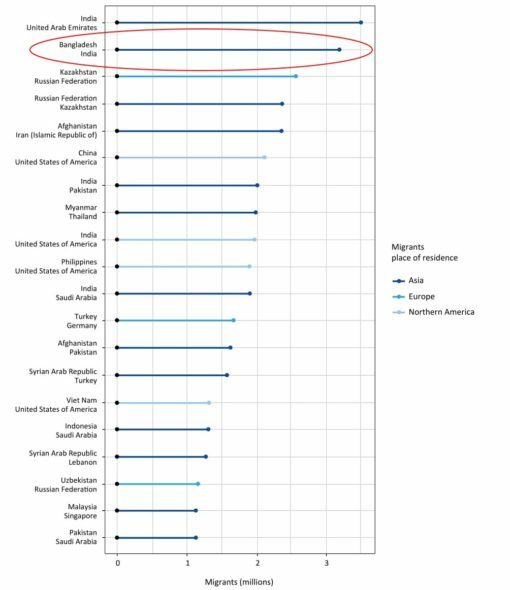 The World Migration Report 2018, drawn up by the International Organisation of Migration, a UN affiliated organisation, states that the total number of immigrants from Bangladesh, whether present legally or illegally, comes to a figure of 32 lakh. You can find the full report here. 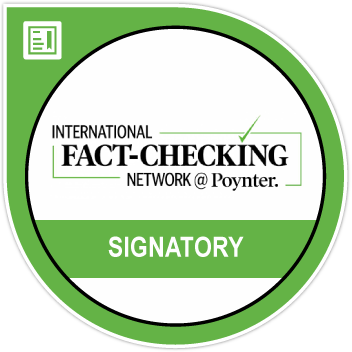 Check page no. 57 for the below graph. The report also states that the overall number of foreign-born immigrants living in India would be around 52 lakh (including those who are here legally), almost a tenth of the 5 crore figure tweeted by Mr. Patel. Therefore, we have good reason to believe that the 5 crore figure claim has no factual basis.